Gravity pushes Etna towards the sea and it is dangerous. Gravity pushes Etna toward the sea, increasing the likelihood that the slope of an active volcano may once collapse. So far, there is no evidence that such a collapse is inevitable, but a new study shows that the southeast slope of the volcano is moving both above the ground and under the sea. These movements mean that the risk of collapse of the slope is higher than previously thought. 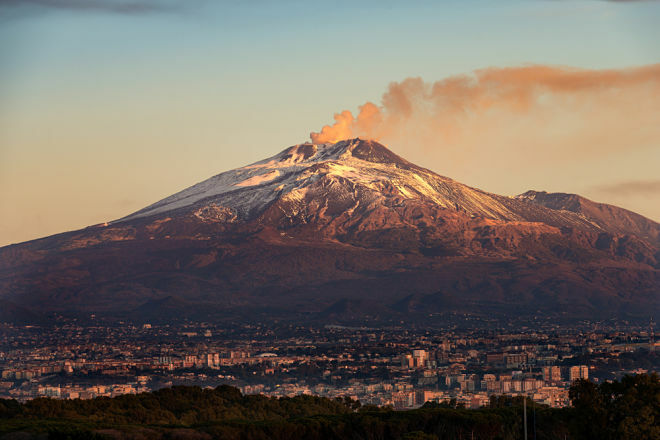 Etna – the most volatile volcano in Europe. This mountain has experienced periods of activity since 6000 BC. and is now in an explosive cycle, which lasts from September 2013. Researchers using satellite data and GPS sensor measurements see that the southeast slope of Etna has been crawling to the sea for at least 30 years. In March, scientists from the Open University of Great Britain reported that the slope moved about 14 mm each year from 2001 to 2012. Researchers found it difficult to say why a volcano is crawling because of the magma that moves under it or inside it or because of gravity. Etna constantly spits volcanic matter on its slopes, and gravity pulls the substance down. At Etna volcano “feet in the water.” The slopes continue below the Sicilian coast and go to the Mediterranean Sea. Using a network of sensors on the seabed, scientists measured how sound travels from a transceiver to a transceiver, every 90 minutes from April 2016 to July 2017. The time it takes for the sound to transmit shows the distance between the transceivers, and so the researchers can determine any changes on the seabed. They found that over the eight-day period in May 2017, the crack on the submerged side of the mountain moved by 4 cm. It was not an earthquake; the movement took place without a crack crack and without seismic waves, rather as a gradual slip. The area, which the researchers measured, is far from the magma chambers in the center of Etna. This means that the movement is the result of not raising magma through the underground chambers of a volcano; it is an inexorable work of gravity that acts on the entire slope, both under water and above water. This is bad news for Sicilians. It is known that the collapse of other large volcanoes caused huge and rapid landslides, and if landslides fell into the sea, they were formed by tsunamis. The chances that a collapse will occur on Etna are not yet quantified. Scientific observations of the mountain are carried out only a few decades, and the whole history of Etna extends over 500 thousand years. It takes more observations to find out if there is a change in how the slope is moving and to assess the risk of collapses. Previous story As a result of an avalanche in the Himalayas, nine climbers were killed.